After our wonderful adventures in Panama, Diane and I wanted to do another birding trip this year. Another international trip was not possible, so we decided that the Rio Grande Valley Birding Festival in November in Texas would be perfect. 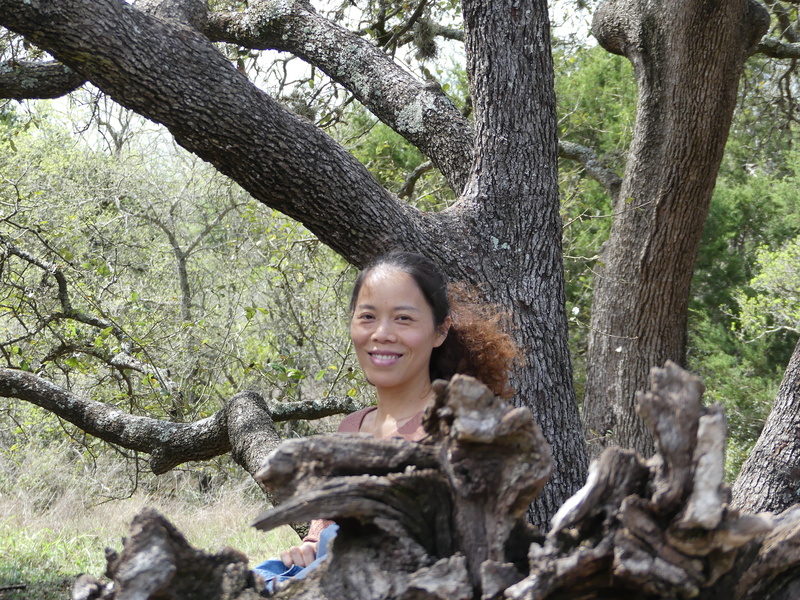 Diane would be able to see her first Green Jay and other amazing birds of South Texas. 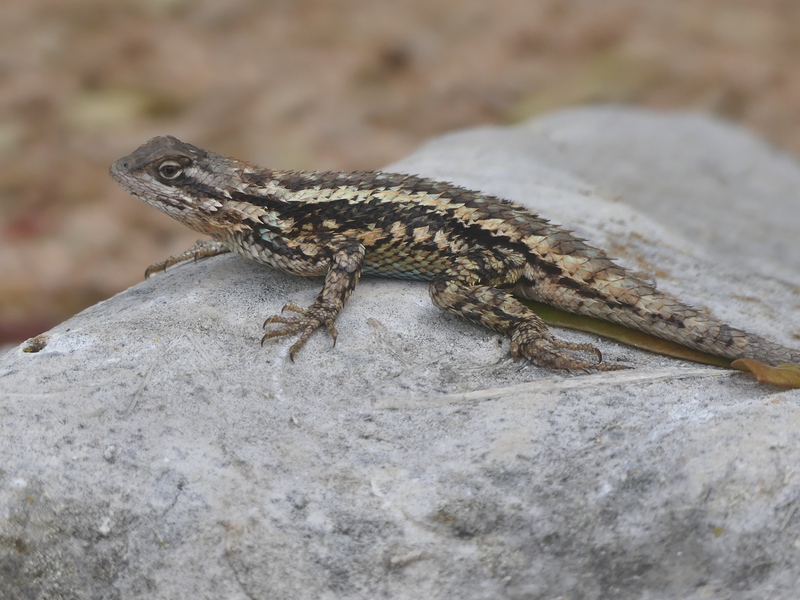 I would be sure to get photos of new species and maybe even a few lifers if I were lucky. I drove to Texas in three days and got into Harlingen a full day before the festival began. 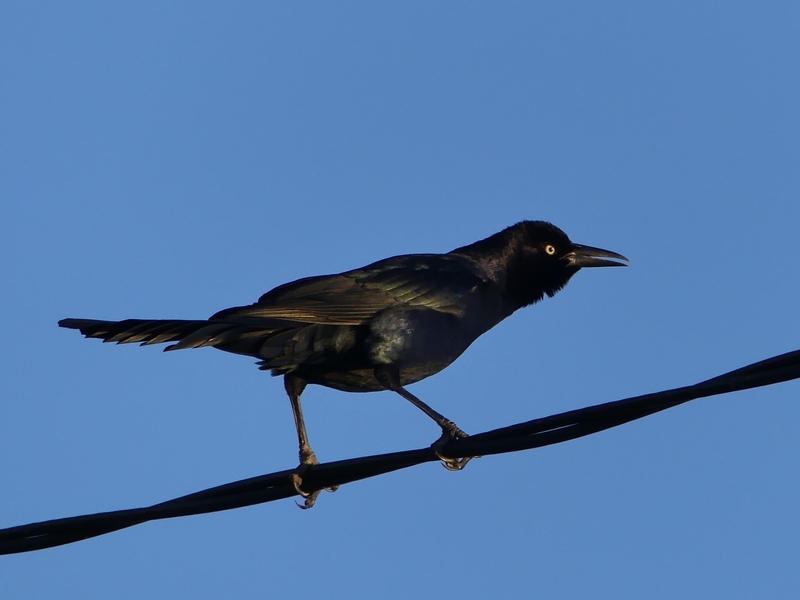 I was greeted by thousands of Great-tailed Grackles on the power lines by the hotel. Although very common birds, the spectacle of the grackles and starlings loudly screeching and their intermittent murmurations as they flew and then resettled on the wires was exhilarating. 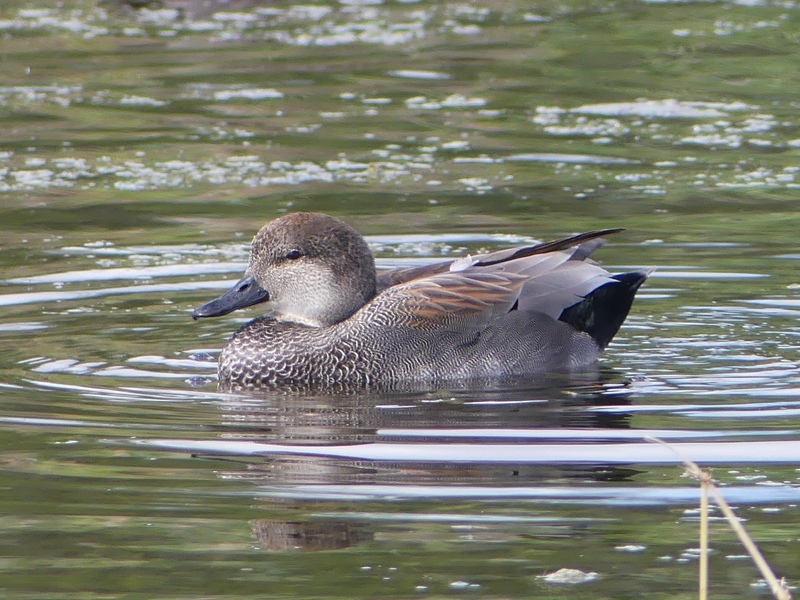 Gadwall is a common duck that I’ve seen many times, but never so close as at Estero Llano Grande. I started my first full day in South Texas at Estero Llano Grande State Park, which turned out to be one of my favorite locations in the valley. 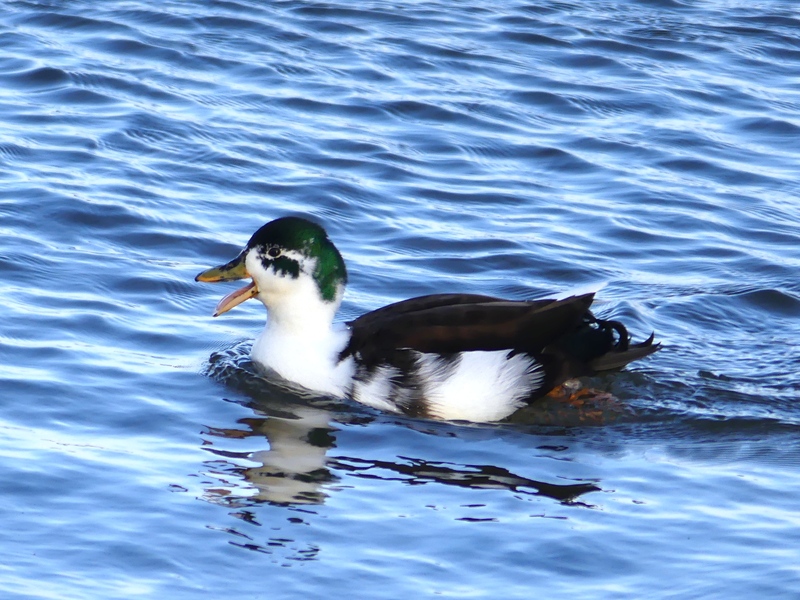 The pond in front of the Visitor Center draws many species of ducks, all very close. But, this park may be best known as an almost guaranteed place to see Common Pauraque. Park rangers share the daytime roosting locations with visitors; otherwise, it would be nearly impossible to find this bird nestled in the leaves. 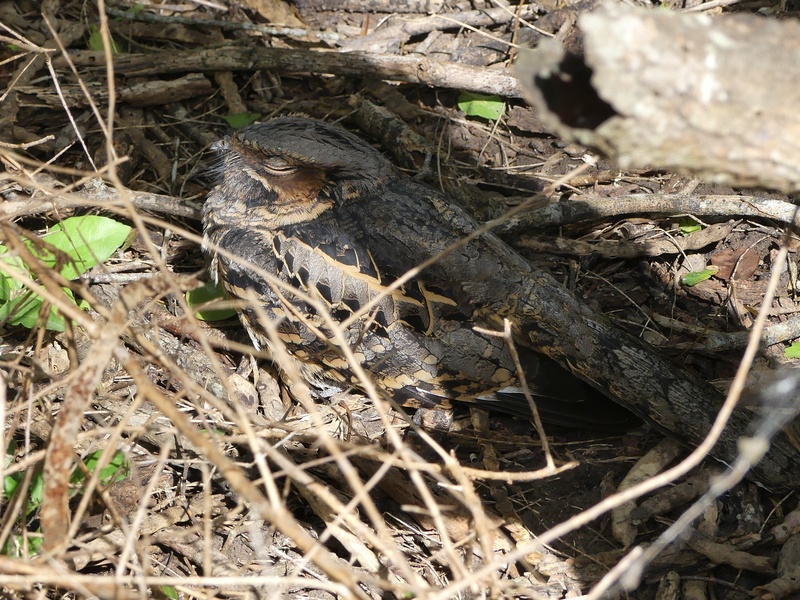 Common Pauraque are nocturnal birds that roost in leaves and brush piles during the day. Their highly effective camouflage makes them difficult to find. It was a wonderful morning with Green Kingfishers, White-tailed Kites, and many more. But, it was hot! By noon, I was about to drop from the heat. I met another birder who was also interested in looking for Mountain Plovers, seen in the past just north of Harlingen. 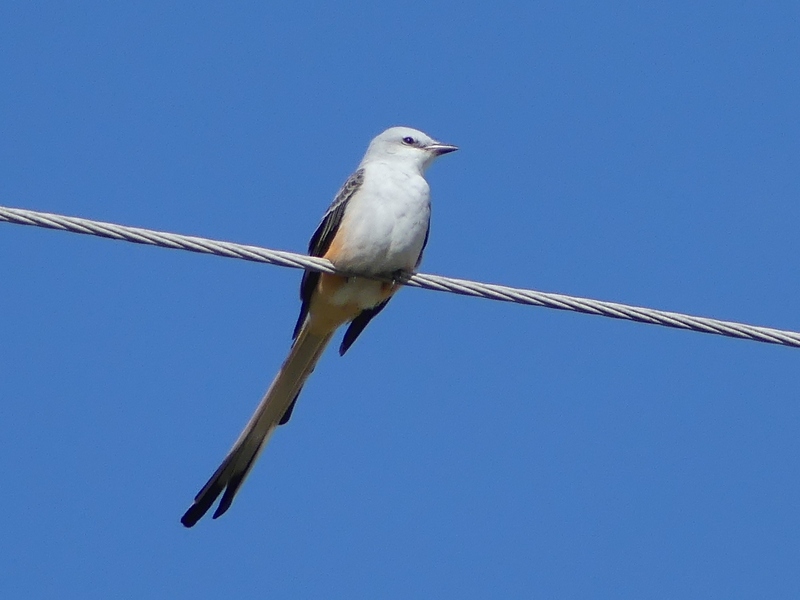 We joined forces and spent the afternoon in his air-conditioned car searching the fallow farm fields without success, but we did see raptors and other birds including a gorgeous Scissor-tailed Flycatcher. Diane arrived on Tuesday evening and we went to bed early for our 4:15 AM wake-up on Wednesday. 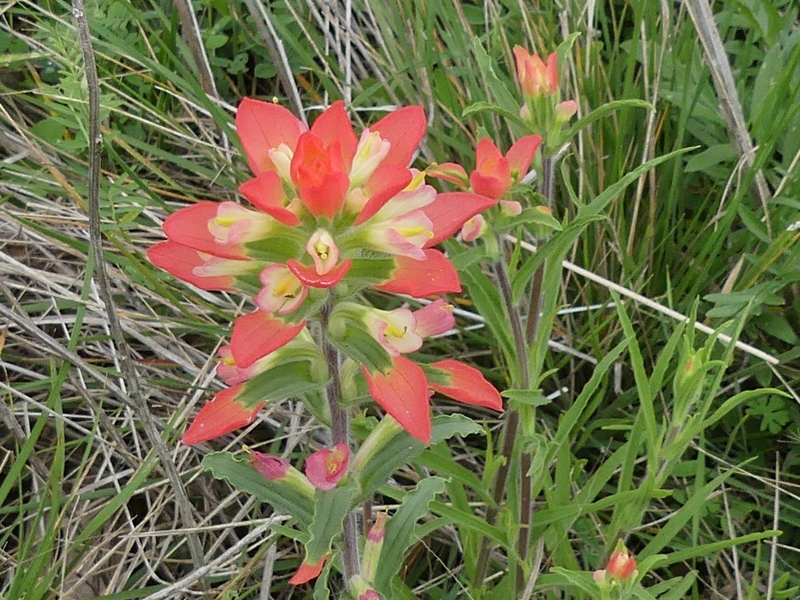 Our first festival field trip was to Las Estrellas Preserve, a 415-acre Nature Conservancy property that was purchased to protect the federally endangered star cactus, a spineless succulent with yellow flowers which is known to grow only in Starr County, Texas, and a few places in Mexico. 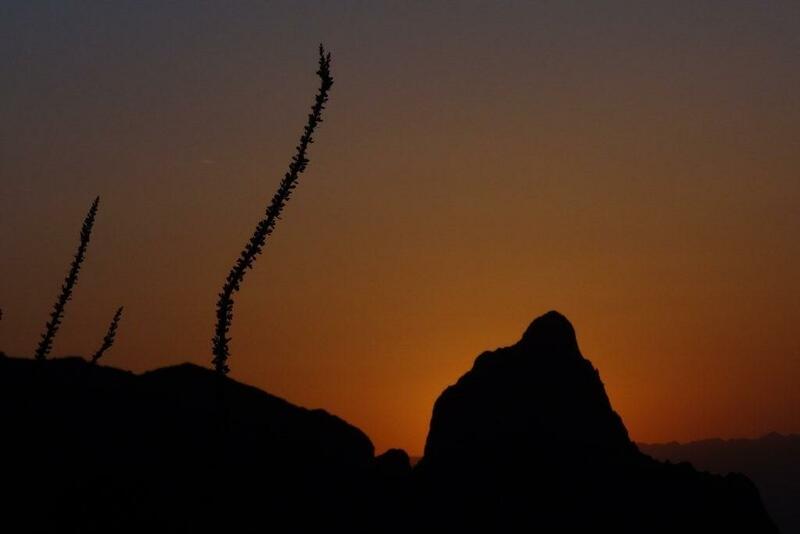 Because the cactus is vulnerable to poachers, the property is not open to the public. 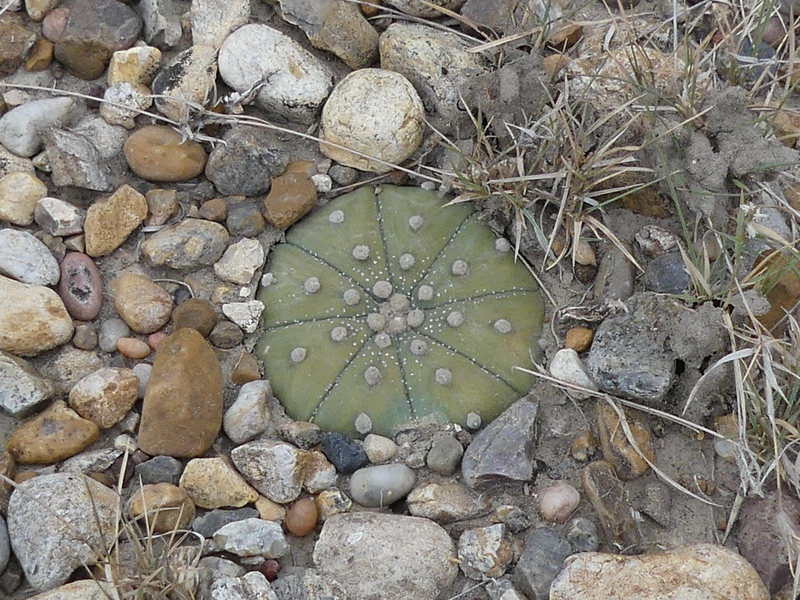 Star cactus shrinks to the ground when stressed. It was not in bloom when we visited and it was difficult to find. Next it was on Rancho Lomitas for lunch and a visit with Benito Trevino, owner of the ranch and the leading ethnobotanist in South Texas. We were all fascinated by Benito’s knowledge of the history and uses of native plants. Plants were the focus of this locale, but we had hoped to also see Audubon’s Oriole here. Our guide did catch a glimpse of one, but the rest of us missed it. 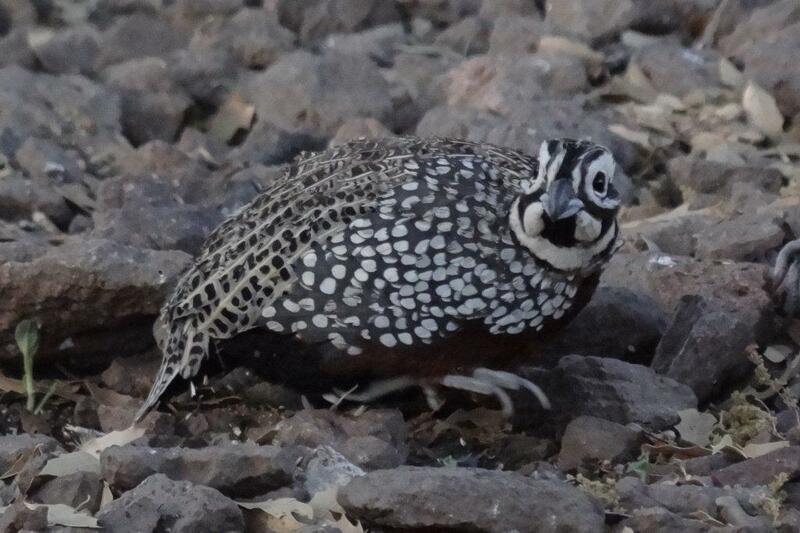 However, we were very happy with good looks at Scaled Quail, a Greater Roadrunner, many other birds, and Benito’s fascinating stories about plants. 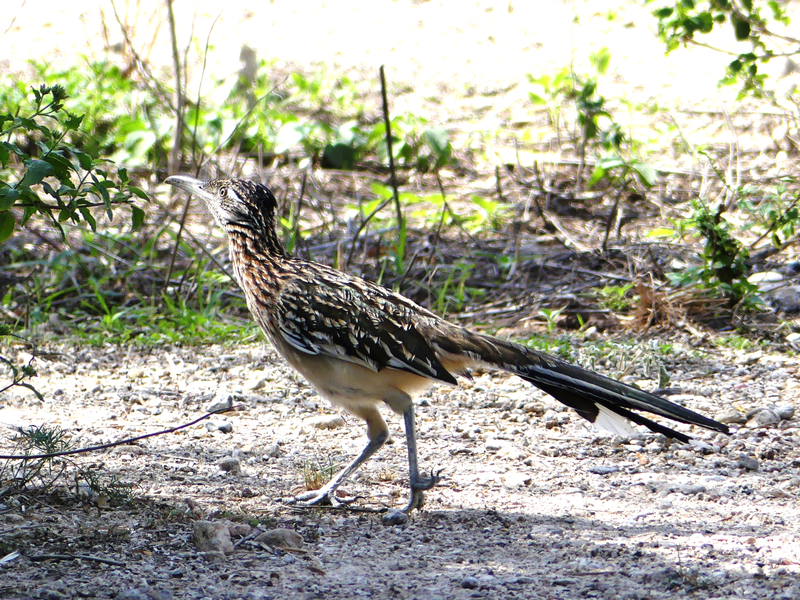 A Greater Roadrunner played hide and seek in the courtyard, mostly hiding in the vegetation. Here he dashes across an open area. 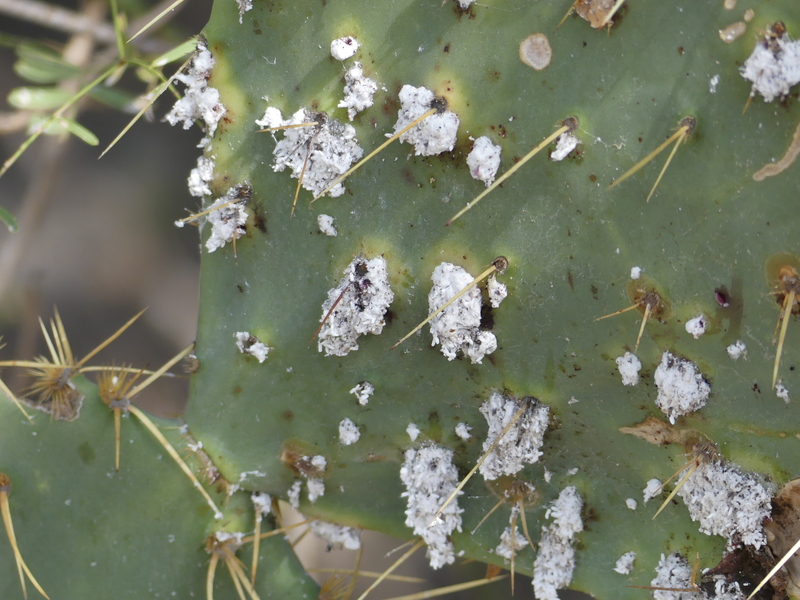 Cochineal, an insect, growing on prickly pear cactus. We learned how the Indians used cochineal to make red dye. For day two of the festival, Diane and I had chosen the Upper Rio Grande trip with visits to Roma Bluffs, Chapeño, and Salineño. There are famous feeders at Salineño, where we hoped for another chance to see Audubon’s Oriole, but we missed it again. It was fun to meet Noah Strycker (one of our guides for the day) and we loved sitting at the Salineño feeders watching the Golden-fronted and Ladder-backed Woodpeckers, Plain Chachalacas, Green Jays, Orange-crowned Warblers, and all the other birds that come for suet, seed, and nectar. A gorgeous male Altamira Oriole at Salineño. We got back to Harlingen in time for our late afternoon Parrot Trip. We could have found the parrots by ourselves, but quickly decided that this was $40 well-spent just for the fun of being driven around town madly searching for parrots. We were in one of three vans, all communicating by walkie-talkie. It was an efficient and fun way to quickly find the target birds. First, we saw Green Parakeets, which I had seen on my trip in April 2011. And, then one of the vans found the Red-crowned Parrots. 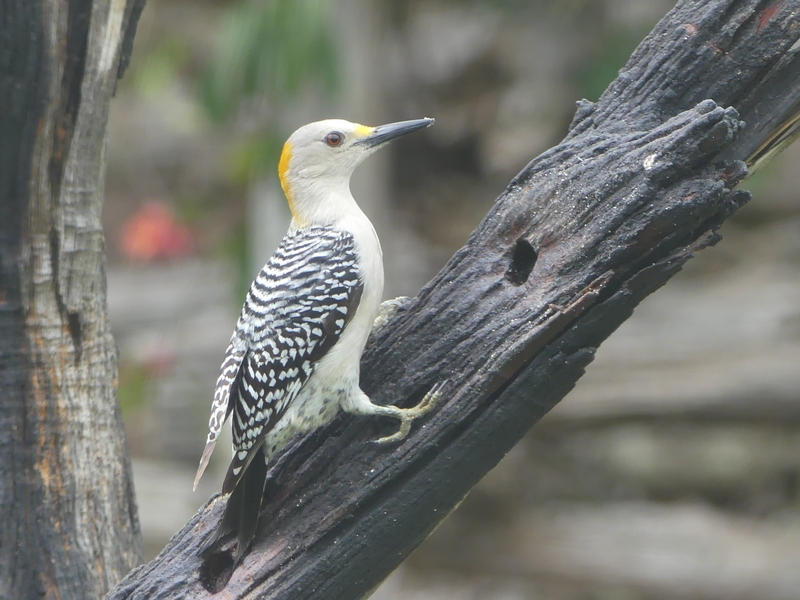 Finally – my first life bird at the festival. Nothing is more fun than watching parrots with their loud, affectionate, and comical behavior. 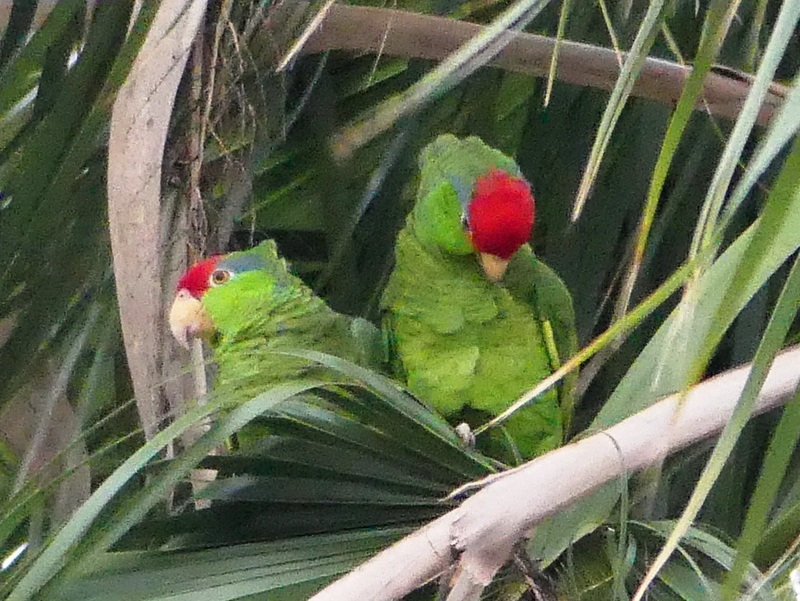 Red-crowned Parrots in Harlingen. We learned that they not only mate for life; pairs are together constantly and can even be distinguished in a flock by their close proximity to each other even in flight. The third festival day, Diane and I did different trips. I opted for Southmost Preserve, another Nature Conservancy property not normally open to the public. Both Tropical and Couch’s Kingbird are common in the valley, but they are nearly impossible to differentiate unless heard vocalizing. 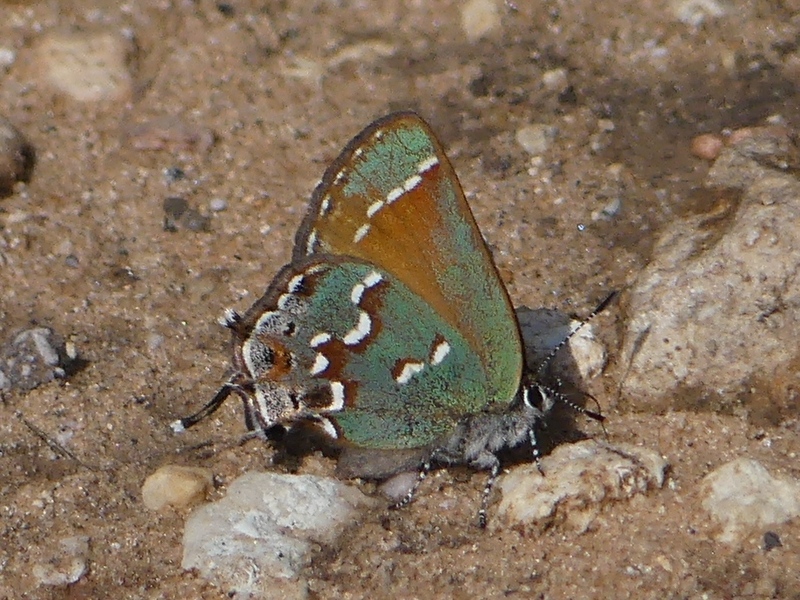 On this trip, we had several individuals of both species. 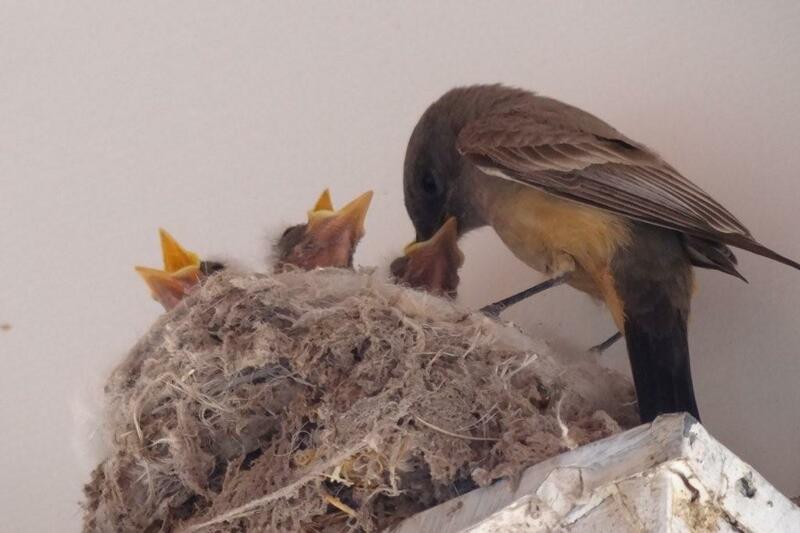 And, we heard one Couch’s Kingbird not just calling, but singing his full song. 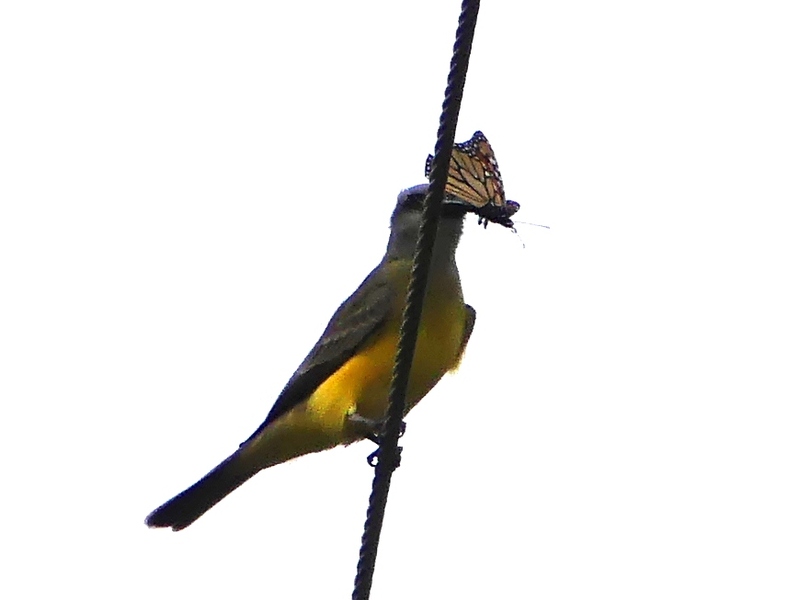 It was also interesting to see the kingbirds catching and eating Monarch butterflies. Couch’s Kingbird with a Monarch butterfly at Southmost Preserve. It was a great morning with many species ranging from ever-popular White-tailed Kites to a rather rare Warbling Vireo. Friday evening was a festival highlight – Noah Strycker’s keynote address about his Global Big Year. Off-stage, Noah is a very nice person, quiet and unassuming. On-stage, he morphs into an animated and dynamic speaker. The audience was totally awed by his fascinating stories. Noah impressed me, not just with his spirit of adventure, physical fortitude, and calmness in challenging situations, but also with his kindness, humility and obvious love for the birds and people of the entire planet. 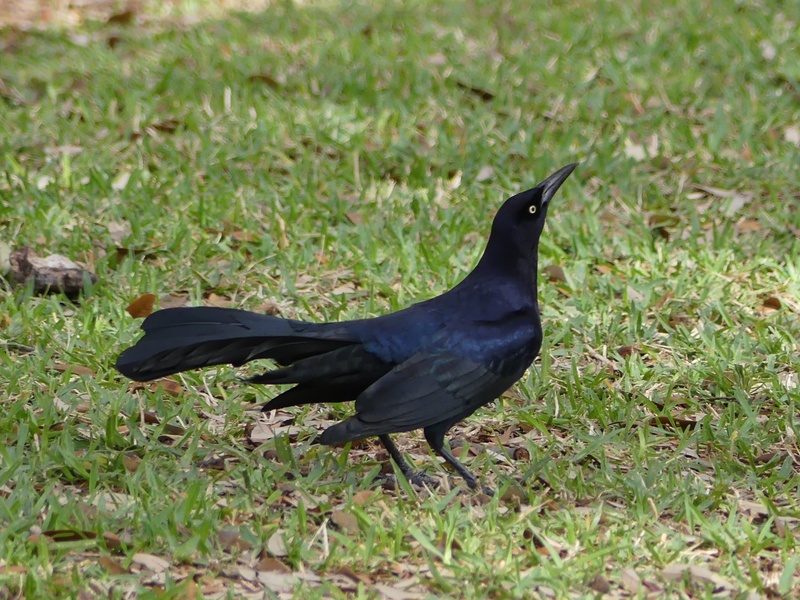 We listened to a lot of Great-tailed Grackles with Nathan Pieplow. On Saturday, Diane and I did different trips again. 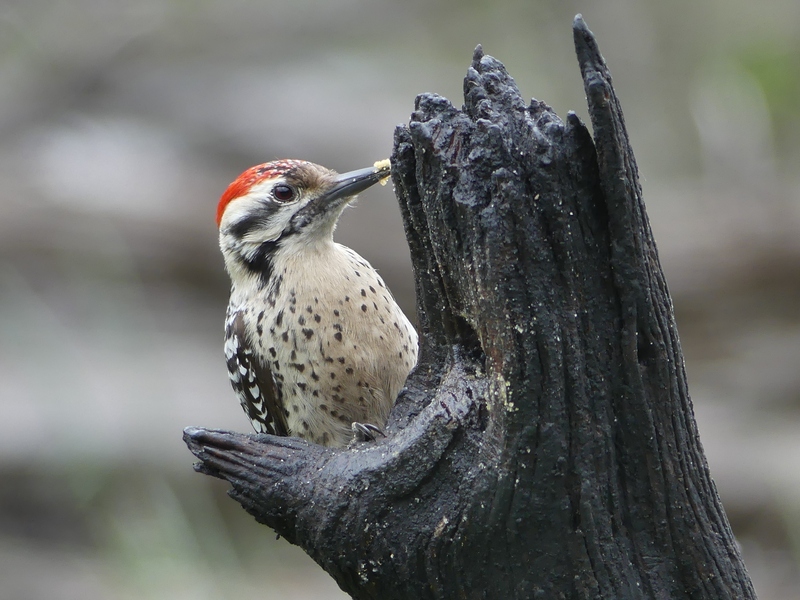 She choose the Laguna Atascosa National Wildlife Refuge tour which included parts of the refuge not normally open to the public, where they saw a much sought-after Texas bird, Aplomado Falcon. I choose Nathan Pieplow’s “Bird Sounds Decoded” field workshop. We had a small group and it was really fun to get an introduction to Nathan’s method of identifying birds by ear, a method that does not require memorization. I bought Nathan’s book Peterson Field Guide to Bird Sounds and can’t wait to study it and improve my ear birding skills. Our leaders were always alert to interesting flora and fauna. 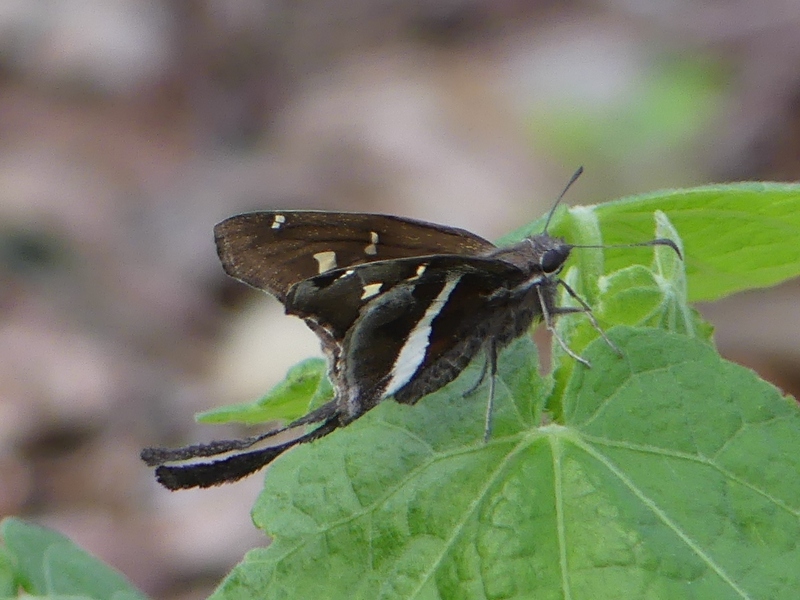 On this morning, Nathan discovered a Red-bordered Pixie, a beautiful butterfly never found north of the Rio Grande Valley. 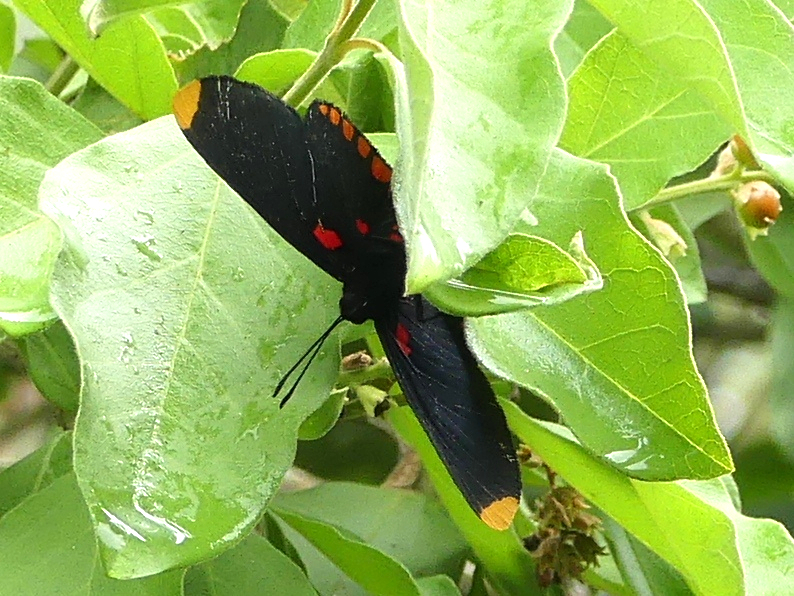 A Red-bordered Pixie at The Inn at Chachalaca Bend. It seems that a rare bird shows up in South Texas during the festival every year. This year, a couple of Tamaulipas Crow were discovered at South Padre Island a day or so before the festival started. 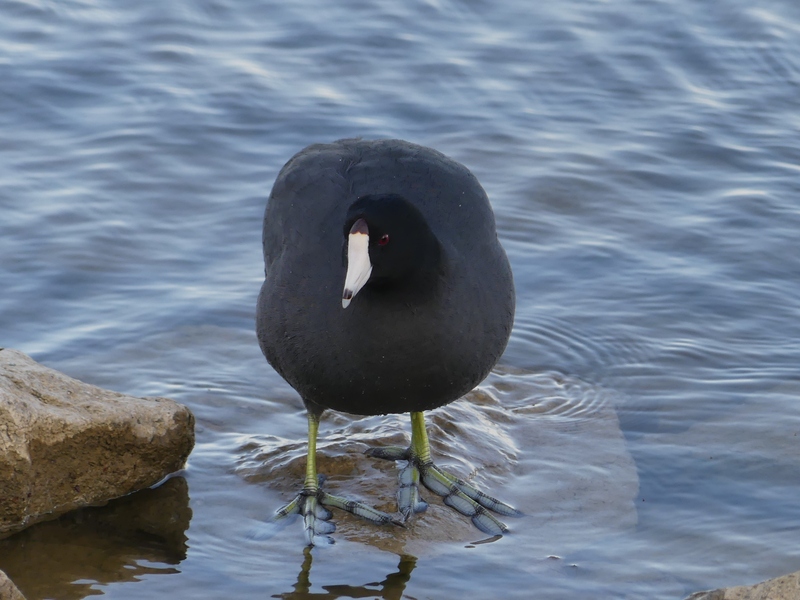 These birds were formerly reliably found at the Brownsville Landfill, but none had been seen anywhere in Texas since 2010. 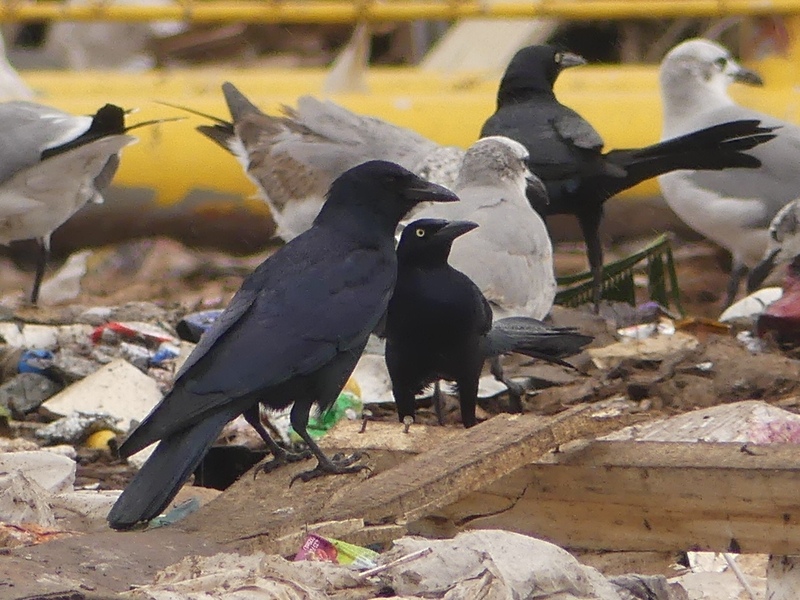 A couple of days after the first sighting, the birds were at the Brownsville dump again and birders were flocking there to add Tamaulipas Crow to their life lists. I was no different. I hitched a ride with Nathan after his workshop and we had great looks at the crow. Life bird #2 for the trip! We observed three Tamaulipas Crows at the Brownsville Landfill. Sunday, November 12, was the last day of the festival and Diane and I were scheduled for what we expected to be the most exciting field trip of the week – King Ranch. The target bird was Ferruginous Pygmy-Owl, which was almost guaranteed to be seen. It had never been missed during previous festivals. But, this year was different. The temperature had fallen quickly and dramatically to 20 or more degrees lower than normal. Ferruginous Pygmy-Owl is a tropical owl, just reaching its northern most range in South Texas. It had not been seen all week, presumably due to the cold weather. On Sunday, it had warmed up again, almost to normal, so we were hopeful. But, it was not to be. 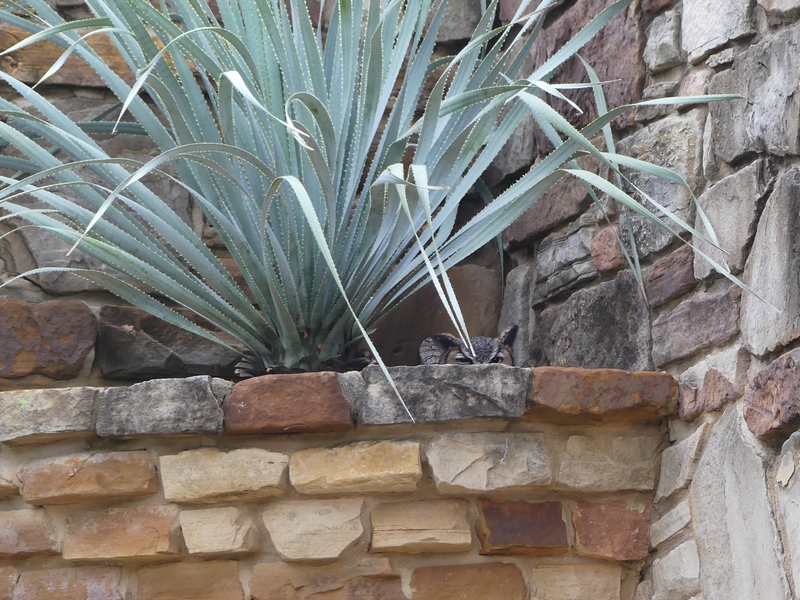 One of the King Ranch guides heard one in the distance, but none of the festival participants heard or saw the little owl. 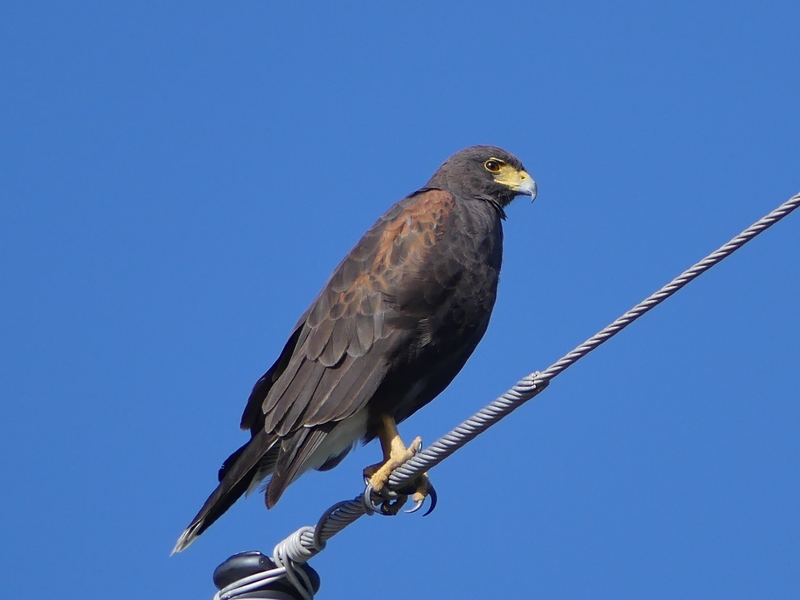 We saw many great birds at the King Ranch Norias Division, including Harris’s Hawk. 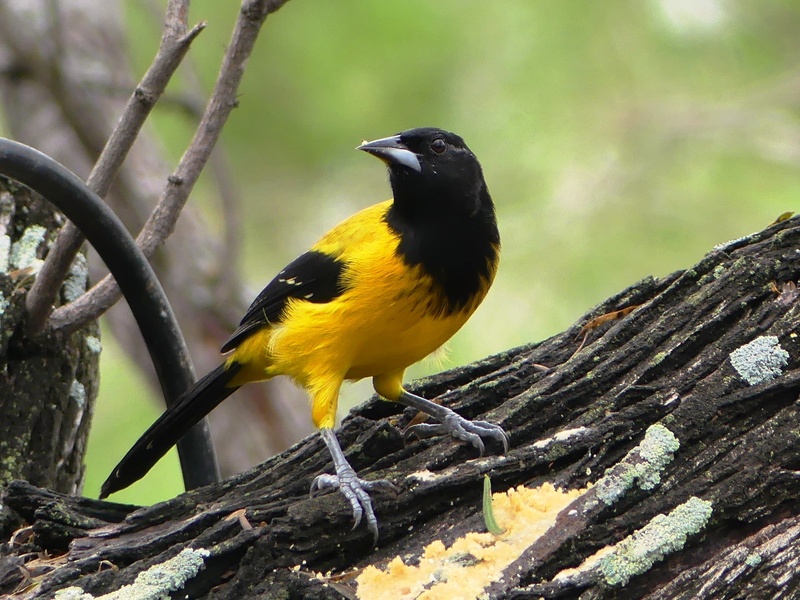 We were also told that we would have another chance to see Audubon’s Oriole at King Ranch, but we missed it, too. Missing the owl and oriole were big disappointments, but there was one consolation. Near the end of the morning, we were looking for Sprague’s Pipits when a guide screamed “Zone-tailed Hawk!” It was not the close look that I wanted, but I did see the bird and even got a poor photo showing the “zone” tail. Life bird #3 of the trip. Diane and I had scheduled three days to bird on our own after the festival and we knew the first place that we would head on Monday morning – the feeding station at Salineño. 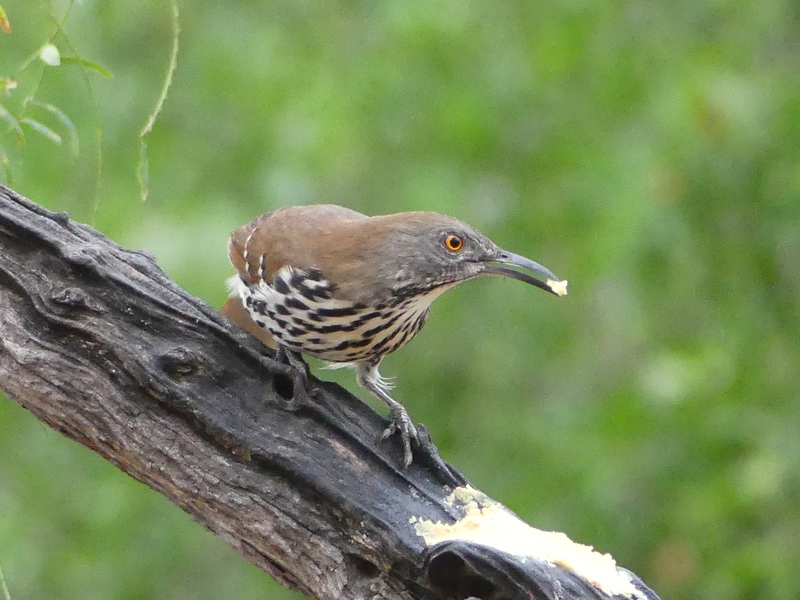 A Long-billed Thrasher enjoying suet at the Salineño feeding area. The Audubon’s Orioles had been seen just before our arrival. We sat there for three hours waiting for them to return, but we enjoyed the other avian activity at the feeders. 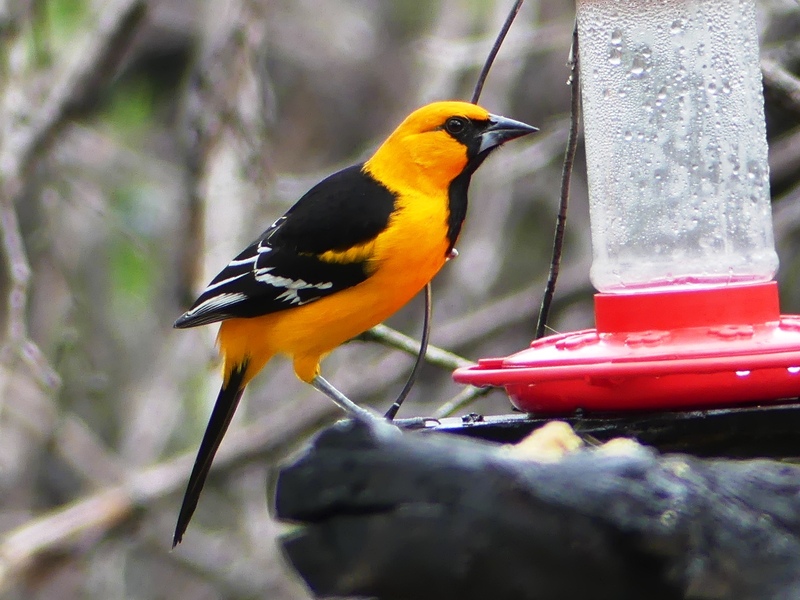 Finally, my most-wanted bird showed up – first a male Audubon’s Oriole and then his mate, both close enough to get great looks and photographs. Life bird #4 and I was thrilled. Male Audubon’s Oriole at Salineño. We stopped at Estero Llano Grande on our way back to Harlingen. We didn’t have much time, but wanted to get a look at a Common Pauraque for Diane. The park was magical, so much cooler than when I had been there a week earlier and we almost had the park to ourselves. 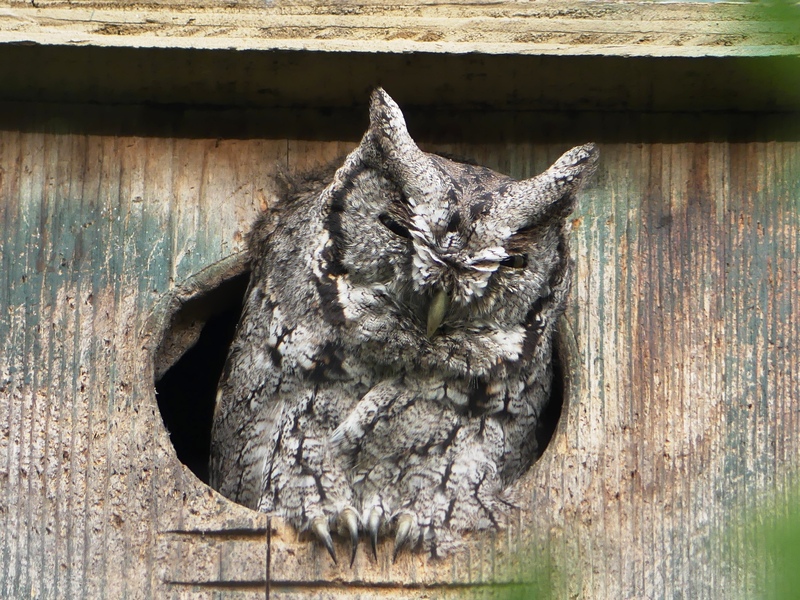 We found the Pauraque right away, and the nearby Eastern Screech-Owl, who seemed to sit looking out of its nest box all day every day. “McCall’s” Eastern Screech-Owl ranges from south-central Texas to parts of northern Mexico. It may prove to be a separate species, as it is always gray and never gives the “whinny” call. 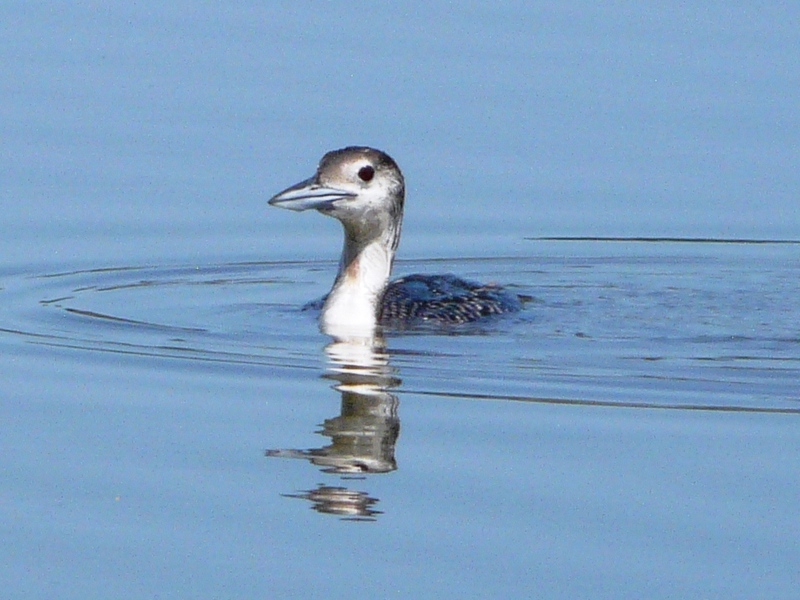 As we left that area and walked by a pond, Diane heard what she was sure was a kingfisher. She tracked down this beautiful female Green Kingfisher in the ditch across the path from the pond. We had both seen this species before, most recently in Panama, but it was a treat to be so close and see it so clearly. 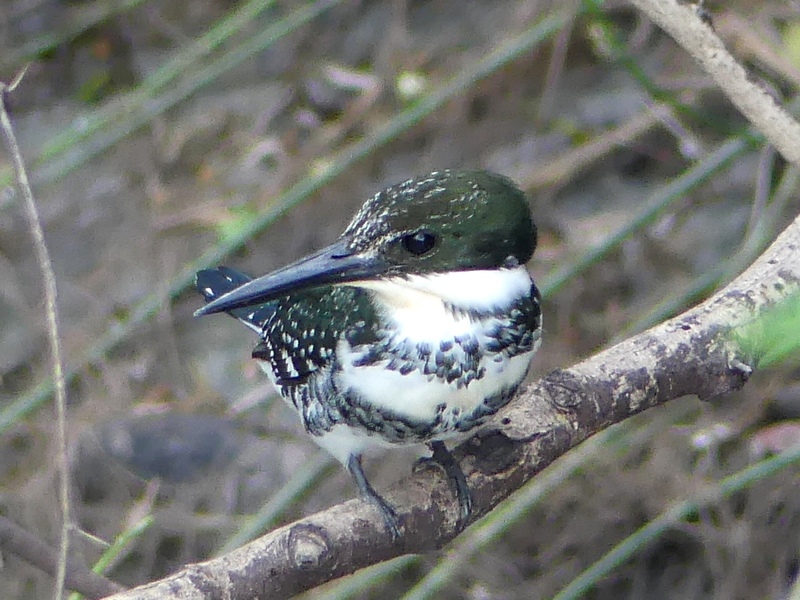 Female Green Kingfisher at Estero Llano Grande. We spent much of our last two days looking for Aplomado Falcon, to no avail. We had both seen it previously, but we were hoping for a better look. 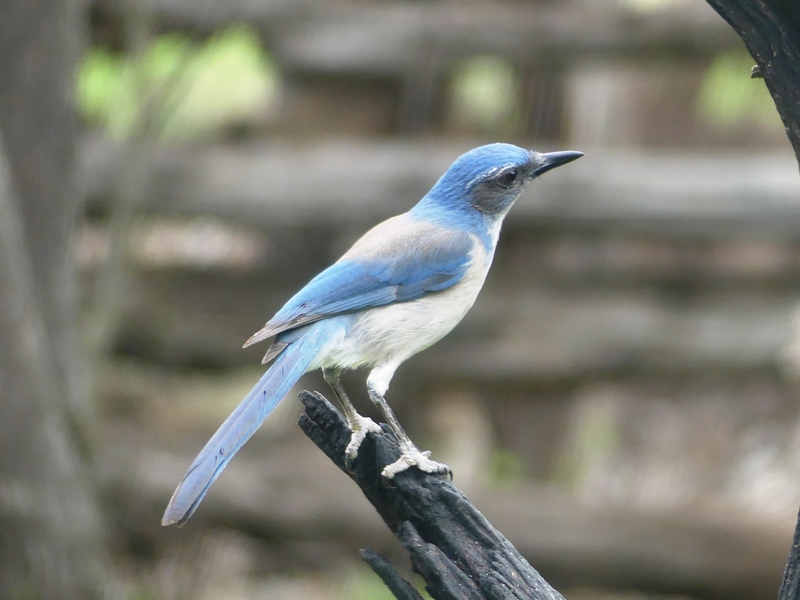 We also went to Estero Llano Grande State Park one more time and again enjoyed the wonderful birds there. 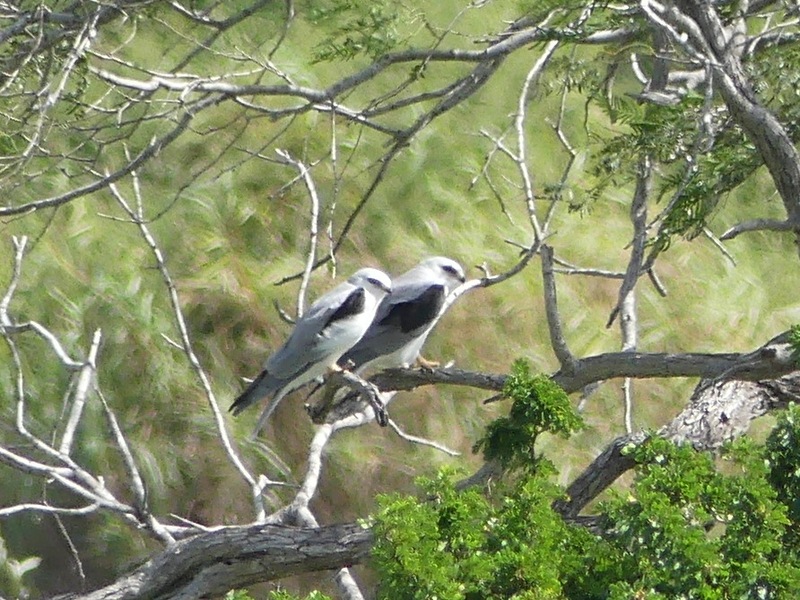 White-tailed Kites at Estero Llano Grande. As usual, our time was up too quickly. Diane flew home and I started the drive back to North Carolina, stopping the first night at the home of a new friend we met at the festival. Birders have to be the friendliest people on earth and making new friends is as good as seeing new birds. It was a wonderful trip and I can’t wait to go back again. More photos from this trip can be viewed in my Flickr album, RGV Texas – Nov 2017. “You should have been here yesterday.” That’s how my trip in April started out. Two friends and I drove from North Carolina to Dauphin Island, Alabama, and High Island, Texas, before meeting the rest of our group near San Antonio. I learned that hot spots aren’t hot every day, even at the right time of the year. I don’t have much to say about Dauphin Island except that it did provide my best view ever of a very beautiful Kentucky Warbler. We also saw so many Prothonotary Warblers that they almost became trash birds. And, take your own food! Perhaps being there Easter weekend didn’t contribute to the availability of dining options, but it was so bad that the last night we voted for the hamburgers at the gas station as our best bet for dinner. At High Island, the bird story was similar to Dauphin Island; we missed the big days before and after our visit. But High Island did give me my first life bird of the trip, a very cooperative Swainson’s Warbler. 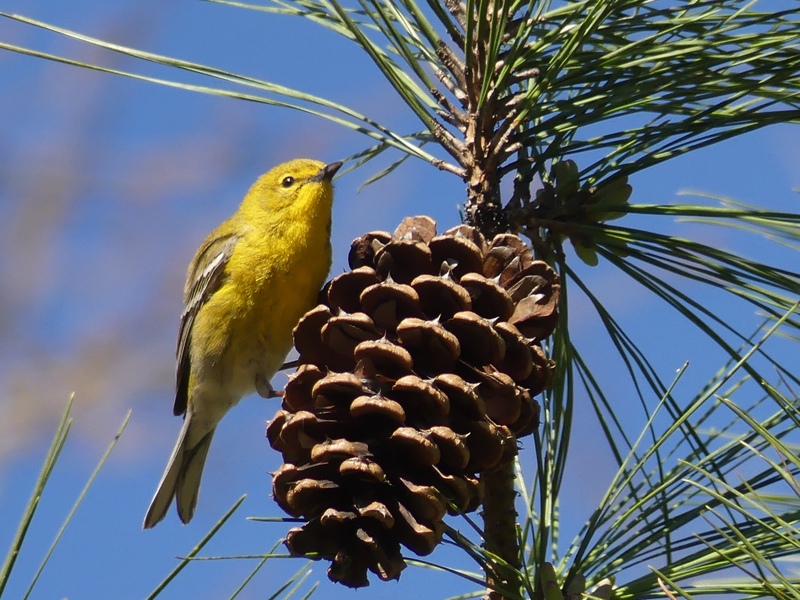 On our first morning at Boy Scout Woods, I asked about finding the warbler and headed in the direction where one had been seen the day before. After searching a short time, I noticed two men intently peering into the thick underbrush. I knew that they were looking at a Swainson’s Warbler. 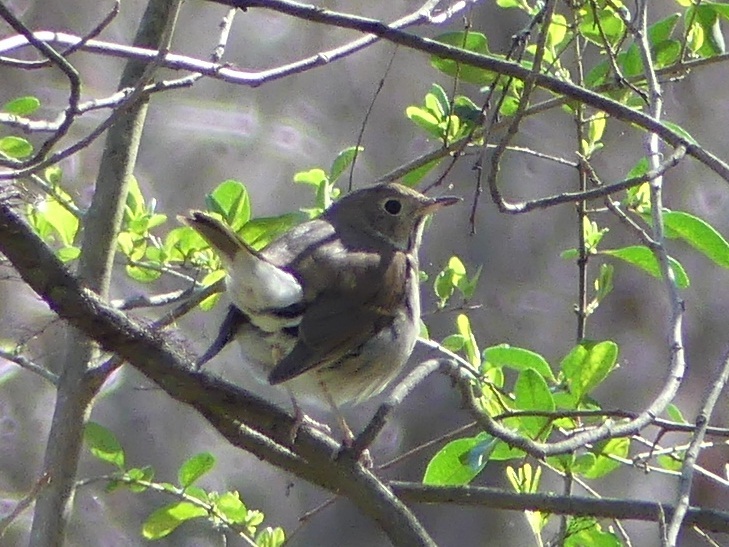 I slowly walked over to the men; they warmly greeted me and then showed me where the warbler was turning over leaves on the ground. Over the next 20 minutes, a crowd of 10 or so slowly gathered and our local expert did not leave until he was sure that every person there had seen the Swainson’s Warbler. A rookery is an amazing place with hundreds of birds packed in so tightly that they almost step on each other. I took the photo at the top of this post at The Rookery at Smith Oaks in High Island. At the time of our visit, nesting birds were predominately Roseate Spoonbills and Neotropic Cormorants with a few Great and Snowy Egrets. 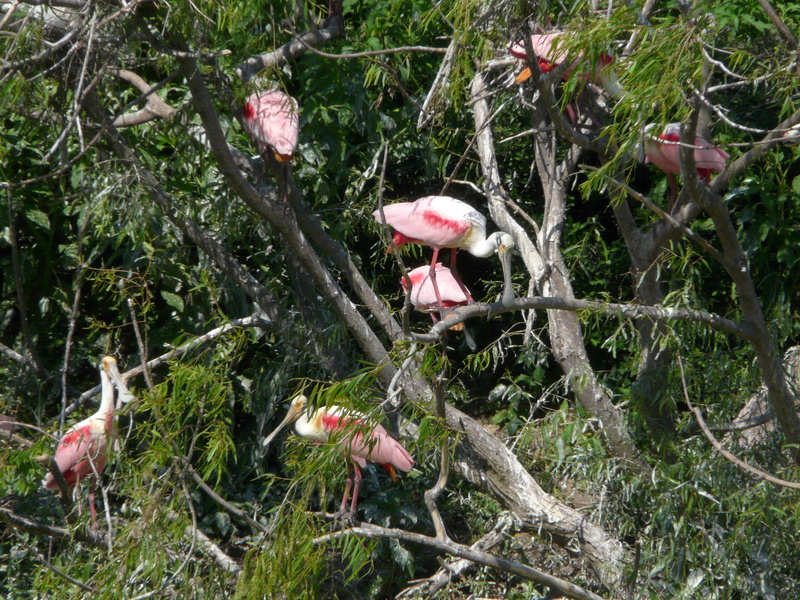 The Roseate Spoonbills were dazzling with their deep pink shoulders, orange tail, and tuft of pink feathers in the center of their breasts. Do you remember Dreamsicles? My friend Susan describes the color of American Avocets in breeding plumage as deamsicle. The thousand plus Avocets we discovered at Bollivar Flats looked like a colorful sea of dreamsicle, black and white. What an awesome moment it was to soak in all that beauty and see one of our favorite birds doing so well that they could congregate in groups of thousands. I have since learned that the American Avocet does indeed have a NatureServe conservation status of G5 (secure) and an IUCN (International Union for Conservation of Nature) status of Least Concern. The global population is estimated at 450,000 adults. Attwater Prairie Chicken National Wildlife Refuge provided a wonderful break on our drive to meet the rest of our group. We had only a couple of hours to spare, but could easily have spent an entire day there. Everything was wonderful – the habitat, birds, butterflies, flowers, visitor’s center. During our short visit, we were pleased to see the only White-tailed Hawk of the trip, a close-up Crested Caracara, Loggerhead Shrike and Scissor-tailed Flycatchers along with ducks, waders, and meadowlarks. We all noted Attwater NWR as a place we would like to visit again as we headed west to continue our Texas adventure.